The kites ware created for a weapon and religious fortune-telling in ancient of China. It is thought that it’s came to Japan in the Heian era(from 794 to 1185 A.D). In time of civil war era, the kite seemed to be utilised as a flying weapon variously in a real battlefield. 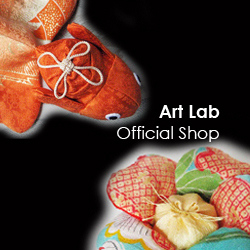 It became the event of celebration for boy birth after it was the Edo era. Also, it was enacted as the celebration of the sixtieth birthday with a kite-flier. Recently, It’s a activity for children especially new year holiday. There are many regional traditional kite since old time in Japan. Each has different name. The Edo kite is also called “Edo square kite”. This “Edo square kite” is a traditional rectangular kite of Tokyo. The feature of this kite is putting a long “growl” on the head, and attaching long “thread”. “The Edo square kite” is called the another name, which is “Edo Nishiki-e (colored woodblock print) kite” with the dye of dozens of colours. 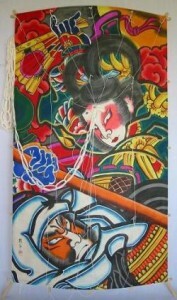 The picture such as the color woodblock print is drawn on a kite . It was drawn an ukiyoe, a Kabuki, a samurais in combat and a fable as theme. 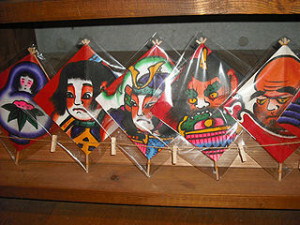 In addition, there are the unique charactered kites, which is painting only Edo style letter and Edo style gothic. The Suruga kite is a traditional kite from the Izu, central and eastern regions of Shizuoka Prefecture. It is also known as a “Suruga squid kite,” due to its odd five-sided shape that resembles a squid. The kite is distinctive for its gills on both sides, which allow it to be flown even in regions such as these, where the winds are relatively weak. The kite is said to have originated during the Warring States period, when it was raised to celebrate a victory for vassals of the warlord, Yoshimoto Imagawa. 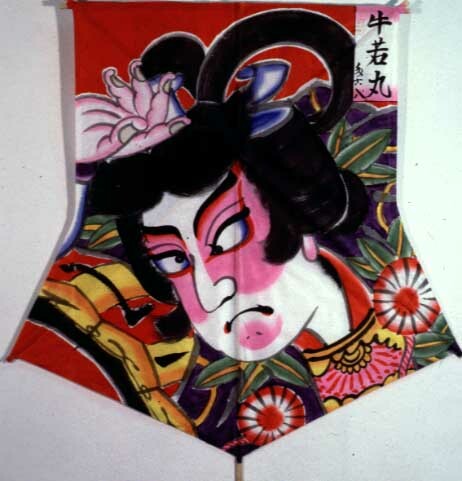 The kite comes in a multitude of designs, most of which depict upper body portraits of samurai or from the kabuki, including Benkei, Gojobashi, Satomi Hakken-den, Bentenkozou, Ushiwakamaru and many more. The Tosa kite is “a square kite made from bamboo and Japanese washi paper which has been directly hand-painted with illustrations. The kite is turned on a 45-degree angle and flown with one corner raised.” Tosa kites are made from Tosa washi, which is produced in Monobe Village (Kami-gun) and air dried for three years. The kites are made in a seven-step process that starts with the design. Illustrations on the kites include crests (such as family crests), characters (such as the characters for “dragon,” “celebration,” or “congratulations”), or images only—“cranes, warriors, Kitaro, Princess Daruma dolls, and the like.” Tosa kites are used not only as children’s toys, but also make valuable arts & crafts objects and interior decorations. The special features of the Aizu tojin kite are its small-format frame that has been formed to make a cross and its distinctive illustrations. A representative type of illustration is the “bero kun dashi,” which portrays a face with colorfully painted eyes and its tongue sticking out. 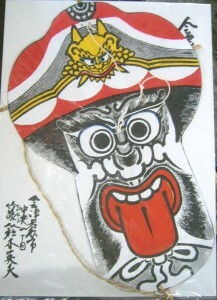 This face wears a warrior’s helmet, and one unique feature of this kite’s design is an ogre that appears on the front of the helmet looking as if it has bitten into it. There are various explanations for this motif, including that it is the image of a foreigner, or that it represents “Garuda, the god of the skies, and Kali, the goddess of war,” both of whom appears in Indian mythology.